Subscribe to Feisworld Podcast with just one click! Andrew and Kevin Atherton are living my childhood dreams. I had to put them on this podcast. Did you dream about flying as a child? I did, nearly every single day. I loved reading comic books and imagined myself as a superhero. I often dressed like one as soon as I came home from school. Recently, my Mom and I went to see our first Cirque du Soleil show in Boston. The show was called Varekai. While every single act was extraordinary, there was one particular segment that left both of us perpetually in awe. Two very similar looking men flew across the entire stadium over the heads of thousands of audience, then balancing on their heads and hands 50+ ft in the air. Their formations looked like paintings, statues and art we had not witnessed before. They are superheroes to me. As soon as I returned from show, I looked up "Varekai aerialists straps" and found Andrew and Kevin Atherton, identical twins, the original performers and creators behind Varekai duo-straps. I emailed them right away without expecting a response. To my surprise, they replied within 24 hours with such enthusiasm to join me on Feisworld. To prep for my interview, I sourced questions from Facebook and Twitter to add to my list. During our conversation, I discovered that Andrew and Kevin are amazing storytellers who not only answered all the questions, but also dove deep into how they engage each other on stage as well as their intimate connections with the audience. "We bring them on stage with us!" Andrew and Kevin were born and raised in the UK. They were professional gymnasts for 17 years before transitioning to aerialists at Cirque du Soleil for 16 years so far with no sign of slowing down. They both recently decided to create a new show and move to New York City in 2016. They will be announcing details and sharing behind-the-scenes updates with you via the News section of their brand new website. To learn more about Andrew and Kevin, please visit their new website, Facebook, Instagram (@andiatherton and @kevin.atherton). Do you enjoy this podcast? If so, please leave your comment below and share the podcast with your family and friends. You can also email me here. Your support will keep me on track and bring many other sung and unsung heroes to this podcast. "Best of all, though, is one that is again seemingly simple. Called Main a Main, Vis Versa, the act features a man and a woman (Yves Decoste and Marie-Laure Mesnage) who perform a slow, sensuous, impossibly strenuous act of strength and balance. Their bodies powdered a cadaverous white, they fulfill our desire for superhuman feats, her body stretching out parallel to the ground while only her shoulders rest on his body." - Variety.com, link above. Atherton Twins:	We have injured ourselves and we were sick and we had it all and we did go through days where we would be in work and really feel that we couldn’t go on stage and I think as soon as we set foot on the Cirque du Soleil stage, as soon as we passed through the curtains all that went away and we had so much love and joy that we were going to perform even to this day when we never felt that we did not want to be there. They brought us into the formation training and they recognized that an acrobats life is very much like that and it is straightforward and disciplined and all that. So you begin formation training and as Andrew said he would begin to do acrobatics and then I would just do it and then we will start to move in ways we have never moved before and you have never thought about it that it is possible to move by acrobatics. Every time we always go back to our first Cirque du Soleil show when we sat in the audience we didn’t know too much about the company and then we sat there waiting for the show to begin. Then the first character came on stage we just sat there watching the show. But I think from that moment we knew that this is what we were going to do and spend the rest of our lives doing this. The feeling we got from them especially one of the shows started like Kevin said before we got goose bumps in excitement all the while we sat with eyes wide watching what was going on, on the stage and that was the most impossible thing. Five minutes before the performance starts Andrew and I will go to the same place where we can view the audience and we will just feel them for the first five minutes and that is part of our preparation for the show. We like to go and just feel the audience and check the crowd just so we can get to see who we are going to be performing for. From that crowd I will pick a person [Laughter] I will look around the audience and every day is different. They don’t see me but I just peep from behind the curtain and every day is different. It could be some particular kind of person, I just see something in that person and I really don’t know what it is and that is who our performance is for that night. It does help because like I said sometimes you can lose focus with so many people there, you can lose the intimacy. You always want to especially keep that intimacy. So it is like building a relationship between each of us and how the relationship with somebody, a few people in the audience and bring them on to stage with us which helps us and also helps them. Fei:	Andrew and Kevin were born and raised in the UK. They were professional gymnasts for 17 years before transitioning to aerialists of Cirque du Soleil for 16 years so far with no sign of slowing down. In fact they both just recently decided to create a new show and move to New York City in 2016 and they will be announcing details and sharing behind the scenes updates with you via the news section on a brand new Website which is collaboration between the Athertons and the Feisworld. So during our one hour conversation we will dig pretty deep into a variety of subjects that interested me a lot. What was it like to represent the UK in international gymnastics competitions? How does it compare to performing for Cirque du Soleil in front of 1000s of audience? The twins together performed over 3000 shows alone just on Varekai never missing a single one. How is this even possible? What do they do when they get sick? Also how do they communicate with each other on stage during the show? What do they do if things go wrong? What was the transition like going from gymnastics to performing arts? What are some of the challenges they experienced especially earlier on in their career at Cirque? With or without makeup how does that impact their emotions and performances in front of the audience? What is the feeling the Athertons would like to leave with their audience? Last but not least how do they prepare themselves before the show? I hope you enjoy this episode as much as I did. If you do please leave a comment or better yet share your review on ITunes during the podcast with your families and friends or email me at feisworld@gmail.com. Your support will always keep me on track in bringing many more sung and unsung heroes to this podcast. Without further adieu please welcome Andrew and Kevin Atherton. Fei:	Oh my God. Hey guys. Atherton Twins:	How are you? Atherton Twins:	We would like the ones you have got though [Laughter] it will be great. Fei:	Yeah. So thank you so much for your time. I know it is right before, not exactly right before the show but you have a lot going on later today. I was wondering when you are going out and when you are introducing yourselves to other people, strangers for the first time how do you go about that? Like what is that you do? Atherton Twins:	I guess that is not difficult. Most people around the world know about Cirque du Soleil so they know when we mention the word Cirque du Soleil and they have an idea what we do and even when we are saying what exactly we both do it is very difficult for anybody to contemplate exactly what it is because it is almost impossible for us to explain what we are doing you know it is like it is almost that is what we consider our dream job. Fei:	Wow. It is really incredible. People asked me, “Why do you want to interview you know such amazing performing artists?” I realized for me it is about interviewing people who are living my childhood dreams. It is really a privilege. So before we get into Cirque du Soleil as I am sitting here and this is exactly a week and a half after my mom and I went to watch Varekai in Boston. [Laughter] It was absolutely phenomenal. I have got to tell you her reaction because my mom is a very successful artist and she was just screaming as part of the audience, like scaring children near us and she was watching the particular segment that you created and she said to me, “Wow, this is phenomenal.” And she asked me and she said, “I think you know I can see the intimacy. I think they are lovers. There is like this beautiful love created.” I said, “I think they are twins”. And you know neither one of us was correct because we weren’t actually watching you that day. Before we get into the show business and in general Cirque du Soleil I want to go back to sort of when you were both little boys and could you tell my audience a little bit about sort of your upbringing, family dynamics and where you are from. Atherton Twins:	We are English boys obviously you can tell by the accent. We are from northern England a small little town called Wigan. I don’t know we had an older sister and we were both very, very active children when we were growing up. We drove our parents crazy. We pretty much tore the house apart. So from being quite young they sort of tried to get us into different sports. We were into every type of sport – football, rugby, swimming, we went to dance you know and it was only when we did our first gymnastics class we were at the age of 7 that it really struck us some way and it resonated in us both and we just loved it from day one, our eyes lit up and we had passion and we never stopped from our first class. I think we quickly went up our training first it was 3 times a week, then it was 5 times a week and after some time we went like 6 times a week. We just loved it so much. We had so much passion. I think mainly because you never stop learning. There is always something new to learn in gymnastics and you wanted to push yourself up a little bit further and take it a little step up. So we just had a huge passion from the very start. Like I said we never ever stopped and we were both very, [Inaudible 00:11:22] it may sound crazy. Gymnastics is an individual sport especially even in childhood if you fail it is your fault and nobody else’s. We both were doing what we liked but our parents were very adamant that they brought us up that even though we were twins they brought us up separately. So even at school we had to go to different classes. We were never in the same class together. So we had separate friends. In gymnastics we travelled separately. We were each in our individual way. So they just encouraged us that way and I think that helped us both in our life and then when we got to Cirque du Soleil they helped us create something magical that we did with our duo act. Fei:	So one other, you know as of yesterday I have started sourcing questions from my audience and one of the first questions, many of them I couldn’t think of myself. One of the questions was, “Are you actually twins?” [Laughter] So apparently in the US in shows where people call themselves twins but they are actually not so you got to respond to that very quickly. Fei:	Take a look at the pictures. Fei:	This is the happiest conversations I have had in a very long time. When I was watching the videos on your website I was just listening to you talk and I realized even though you are identical twins you are actually very different. We have exchanged several emails and me listening to some of the videos I could very easily tell your voice apart which is kind of phenomenal in itself but you are both so competitive in gymnastics. What was that dynamics like? What was the competition not only with a sibling but with a twin brother? Like what are some of the things that you know we don’t know about? Atherton Twins:	It was great because like you said we are we are very competitive. It is a very healthy competitive nature that we both have and not just with each other but with everybody else. You know we always want to be the best and I think the fact of having a twin brother who is equally competitive as you are and in a healthy way it helps you know recreate yourself. Every day in the gym we try to better each other. Every competition we are always trying to win each other. It happens you know most of the time one of us would win a competition and the competition would be which twin would win and that was never a planned thing. That was just the way it happened. So I think as far as in our life and now when we got into Cirque du Soleil it is a very healthy competitive nature we have. Fei:	How are you guys the same and different when it comes to strengths? And to me as an artist when it comes to gymnastics and how are you guys different? Atherton Twins:	We are both actually focused and we are both disciplined in our approach to certain things. Well I think the differences mainly come in the activities that we are interested in. Fei:	I noticed that just by watching some of the videos. [Laughter] So what really amazed me is I had a very brief conversation with Andy or Andrew just last week and I am originally from Beijing, China and growing up as you can imagine when we still watched a lot of TV when it comes to the Olympics I remember I just watched it with my parents. I am the only child by the way. I was just watching Olympics and hoping that the Chinese athletes would win in basically two categories – one, gymnastics and the other is ping-pong or badminton. There are many other sports we didn’t really stand a chance until more recently. So I remember chatting with Andy and I believe you were competing in gymnastics, maybe you both at some point in China and were you beating China at that time? I was wondering after I hung-up. Atherton Twins:	Well no, we were not beating China. The closest was I came close to China but they were a pretty dominant force in the gymnastics world. They always have been and they always will be. One of the early memories that we have when we were just starting in gymnastics was watching a Chinese training video [Inaudible 00:17:16] china because they were pretty secretive then of their training. It was such an impressive thing to see the discipline that they had and the focus that they had, the energy that they had to train. No one could compete with that. Fei:	Oh, you are so humble. Atherton Twins:	We would always look at them and it was such an aspiring thing for us to try and reach it. They had so much style and so much grace and so much and they were a beautiful nation to watch. Fei:	Thank you on behalf of my country. [Laughter] I tried to as part of my research I looked up a number of videos on You Tube when you were both competing. It was just so beautiful to watch. You know it is something that very, I remember going to school a big school of 2000 kids and there were less than a dozen kids who would go through gymnastics routine training and it is just the how early they wake up in the morning as little kids like 4 or 5 in the morning. Their parents have basically arranged their schedule just so that everything in their life will accommodate these training routines. I was wondering compared to how kids are training for gymnastics today, compared to the regiment that you went through what are the same and what is different these days? Atherton Twins:	I think now especially in Great Britain the regiment is lot more they have it a lot slower than the way it was when we were junior gymnasts. I mean our support basically came from our parents. They were phenomenal and like you said they basically worked the schedule around taking us to the gym, taking us off from the gym and they were basically paying for lot of our training. It wasn’t cheaper at that time but they just saw the passion that we had and they saw that we had that it was a dream to go to the World Championships and things like that. They sponsored it. Now the system is it can be a very centralized system supported by the [Inaudible 00:19:25]. So it helps because they need to have that concern and they don’t have to worry anymore because the money is coming from the government. So they have an amazing support system. Fei:	It is very similar to what I have heard interviewing a gentleman, one of my taekwondo instructors who was on the US team back in the ‘80s. He also mentioned very much the same thing of having to pay out of your own pocket to travel, expenses in order to compete. I forgot to mention in the beginning I have been training in taekwondo which is a Korean form of martial arts for about 13 years. Fei:	I need to pause that for a second because I was thinking any sportsman whether it is baseball or basketball you got to take a day off. I mean you might get injuries, you might not feel well, and you might get sick. I mean how was that even possible for 10 years straight? Atherton Twins:	Yes, we would get injured and we would fall sick and we had it all and we would go through days where we would be in work and we would really feel that we could possibly not go up on stage but I think as soon as we set foot on the Cirque du Soleil stage, as soon as we pass through the curtains and walk through the forest all that went. We got past all that feeling backstage, how we were feeling backstage it just all went and we got so much joy, so much love that we were going to perform that particular show and that particular act that it really was not as difficult as people would think because it was just such an easy thing to go out there and just feel the audience, and just get yourself up and do that again and again night after night. Fei:	My goodness. But Kev that is also your life on the line as well. Atherton Twins:	I didn’t feel for one minute I will lose my life because with him I always feel safe because. We used to be able to communicate and you know it wasn’t even a word. We can communicate with each other with our eyes during that. So it went quite well. So we knew that when one of us was ill and the other one wasn’t and I just feel that person doesn’t have to change and it is the other person who you are working who has to change. So when Kevin wasn’t feeling well so I had to change the way I was performing because Kevin couldn’t perform to mark because of it because he was feeling awful because of it during that performance and then it became almost just a beautiful act because what we were doing then was real and we do communicate a lot during the act. Fei:	How do you do that? How do you signal? Atherton Twins:	Yeah, most people say, “Do you communicate by talking?” Well every now and again if something drastically goes wrong I would just say, “Are you okay?” He would say, “Yeah” and we would continue. Most of the time it is just with the feeling. So we literally change what we do with our hands or what we do with our leg which signifies something is not right and we will fix it right away. So there has been times when Kev has not even touching me and I know something is not right and then I am prepared for something to happen that is not going to happen which generally does so I know before it is going to happen. When we first started to work as a duo it was relatively hard because we were so used to work on our own and we were responsible for our own movements and our own mistakes and things. So when we started to work as a duo it was difficult for us both because you will be relying on somebody else and you are trying to unify yourself and become one person. I would say it took about 3 or 4 months of a lot of fighting, a lot of it and then we finally clicked and we did begin to feel that we were working as one body. So even when I didn’t see, as you said when I didn’t see him I knew what he was doing because I would just feel that. After what we have been doing for 15 years now it is like second nature you know we just do it and we just know. Fei:	I am so glad that you brought it up because one of the questions just listening to one of the videos was you said you had some struggles earlier on going from solo performing artists to a combined duo. So what are some of the earlier struggles that you had and how did you overcome that together? Atherton Twins:	I think at the beginning it was when we first joined Cirque du Soleil and they were amazing. We didn’t know at that time but when they brought us in I guess we had to come in to do 56 hours intense training with Cirque du Soleil which involved acting, singing, dancing and specific acts that they were brought there to create. When I and Kev came everybody had something to do. Mine and Kevin’s schedule was blank every day, all day. We were really confused and we said, “Where are we?” They just put us in a room by ourselves and said, “Work together” and they did that for I think the first three weeks. We just went into a room by ourselves with nobody around and they just said, “Work together”. It was amazing because like Kevin said I think in the beginning maybe the first week or so we would train together for maximum of 10 minutes. [Laughter] We would fight. We would split open and go over to each other’s comfort zones which was I would go into one gym and train by myself and Kevin would go to another gym and train by himself. Then we would come back and you know talk about it, “You were terrible”. After a week we set ourselves to be able to work together and then it took several months before we could really gel. So Cirque du Soleil always knew that. They knew they didn’t want us to do gymnastics. They really wanted us to be together. So it was almost like a military style. It was a strategy. Cirque wanted to do that. They wanted us to begin to learn to work as a duo. There is only one way you can do that and that is to begin to work as a duo. Fei:	How did they know that? Were you the first twins they had or? Atherton Twins:	No. Cirque du Soleil had many, many twins. So I think they obviously knew. I think they always worked, the other twins always worked as duos. Maybe they never came from gymnastics. Before they brought us to Cirque they would send casting staff to the National Schools and they would all day observe our training. They knew we worked by ourselves. So they must have recognized that we needed to learn and that was a skill. So we needed to learn it and that was the strategy for the first two weeks. Throw them in a room and make them to begin to work as a duo. Fei:	I love that. You had the formation training. I did my homework. I know that is what it is called. I am so intrigued by your 17 year gymnastics career. That in itself it is extremely impressive, 17 years. After that since then you have had I believe 15, 16 years at Cirque du Soleil. Tell me about the transition because I am so fascinated by the evolution of gymnastics that you have created and kind of transitioned into performing arts? What was that decision like? What was that transition like afterwards? Atherton Twins:	The decision at the beginning was it was a long process. Cirque du Soleil contacted us when we were 20 years old. I believe it was during the World Championships in China, Tianjin. We have never heard about Cirque du Soleil before. I think people might have mentioned it but it never really clicked. We came and saw it with [Inaudible 00:28:59] and we just said, “Yes, we will look at this company and what it is about”. But we weren’t ready to finish our gymnastics. We still had ambitions. We wanted to go places with our sport. So we just said, “We will contact you when we feel we are ready.” We never really thought of it again. It was at the age of 24 it was the time when we were both ready to finish our gymnastics career and at that point we contacted Cirque du Soleil and said, “We are ready to come”. The thing was that we spoke about it maybe a year earlier to that and we knew exactly why we wanted to do it then? We knew we wanted to be together and we knew we wanted to do an aerial act with them. So we were very lucky and we had an idea when we got there what we wanted to do. We were even luckier by the fact that Cirque du Soleil allowed us to do that which is not very often. Normally they bring you in to do a specific act if they need a person to be replaced in a certain act that they already have. We were lucky in a way that Cirque were creating a new show which was the first show they created in 3 years and they brought us in to create the show with them and they knew we wanted to do an aerial act together so we were fortunate enough that we were given that privilege to create that act with them. Just to go back to the gymnastics. Gymnastics is a very disciplined sport. It is a very regimental sport. There are so many moves you have got to do in a certain way and at a certain point and everything is done in a certain way. Most people do it the same way. As soon as we came to Cirque all those rules were thrown out the window. Again our comfort zone was very much in doing things a certain way. So we did the formation training and they recognized that acrobat’s life is very much like that. It is very much focused and disciplined and to break all that. So you begin your formation training and understand all that and you will begin to do acrobatics in an artistic way. You will then start to move in ways you have never moved before and you never thought the body was possible to do like that and singing and dancing. It is really not a comfortable thing. They kind of throw you in the deep and make you work. That was the transition that you have to go through to turn from an acrobat into an artist. Because the people over there they had been working with Cirque du Soleil for over 15 years. We classify them as artists and we always looked up to these people. Even now there are still the same people that we still lookup to, we still strive to be like them. Fei:	Who are those people? Atherton Twins:	Well one of the most important ones was a guy called Yves Decoste and he created the statue act which was Quidam at that time which was one of our first shows that we got to see. I think that act resonates so much with us because once you saw the act. It was one of the first shows we saw live and we saw the act. We both just stood there with our mouth open, with goose bumps just watching this guy and his skills doing the most amazing things and we found out who the guy was. He was actually there when we came to do maybe the Varekai, formation training he was in the gym. We tried to recognize him but we didn’t know it was that guy until we started to speak to him. Once we started to talk he told us about his career, work, where he came from, where he was going. You know the experience he had and the knowledge he had Kev and I will listen to things he told and I think we still do. I think the time when we met he was probably in his early 40s and he was in amazing shape and you will never know. He was in amazing shape and was really healthy looking, really beautiful guy. Now he is still performing and he is 55. He is still performing this beautiful act but I think he is on a different platform today. He is still amazing. That was the inspirational thing for us to see somebody like that still having so much passion and so much drive in the artistry in him and he still directs at this age. So we looked up to him so much then and we still do now. Fei:	But then your face is covered. You are always wearing obviously a lot of makeup, there are always masks. Do you think that is different? I know in your other shows your face and your features are fully shown. What is that difference? I feel like for me my self esteem will somehow be preserved if somehow I am covering my look. But does that impact you at all? That is a silly question perhaps. Atherton Twins:	The makeup plays a huge part. I think it is by far the transformation of your regular self to the version of you going out to perform on stage. So it is everything really from the costume but makeup plays a huge role in Cirque and they are really specific on how well you do that because and you do notice the difference when you see yourself performing without makeup to seeing with the makeup. The audience feels that too. So yeah it is definitely part of the transformation from the Atherton twins off stage to the Atherton twins on. Fei:	How do audiences react differently makeup versus no makeup, do you think? Atherton Twins:	We never go out without a makeup, Cirque would not allow it. Like Kevin said every now and then we do kind of TV segments without makeup and it is a drastic change because just in ourselves we can tell it is almost like if we haven’t got makeup on we will be faking it a little bit because technically you transform yourself into the character the way they want you to be. So we would always wear makeup. Even if they ask us sometimes not to we will still put a little bit on just so that we feel like we have made that transformation. I guess the audience feels these artists who do the performance are superhuman being and they don’t really want to have the perception that they are human, they are almost non-humans and the makeup helps them too. Fei:	Yeah. It is so funny because I feel like I have been a mind reader instead of like, “Let us dive in deeper. Maybe let us dissect this question.” And you are dissecting that question for me. [Laughter] I love it. It is so easy. It is the easiest interview ever. [Laughter] One of the things a week and a half ago that I watched the show somehow that weekend I had my personal sort of existential crisis. I was thinking, “What is the meaning of my life?” You know we all have those moments saying like, “Should I read a book? What am I doing of myself?” At that point [Inaudible 00:37:05] more than enough to cheer me up. So I went to see the show and I was sitting in the audience and the only moment I just completely forgot about all my problems and it is really magical. I just felt so peaceful, at ease and was thinking, “How easy my job is”. I mean my job is a joke in comparison to this. What is the feeling through your act, many shows you create on your own what is that feeling and sort of spirit that you would like to leave with your audience? 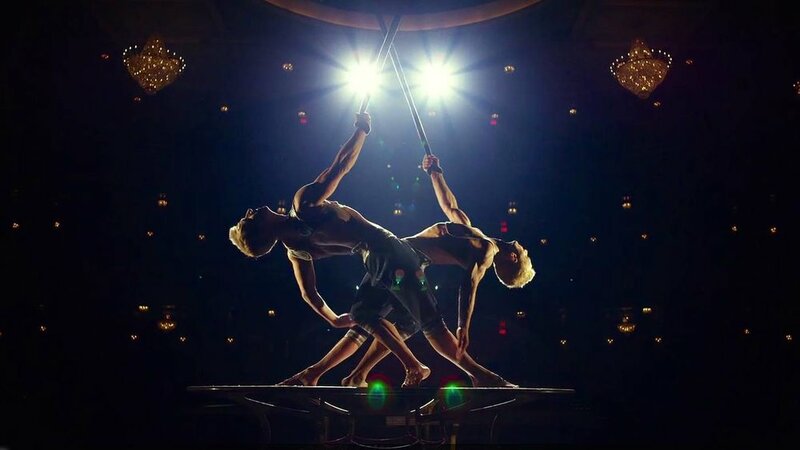 Atherton Twins:	I mean for us the first thing and we talk about this all the time, we always go back to the first, our first Cirque du Soleil show that we sat in the audience. We didn’t know too much about the company and then we sat there waiting for all the shows to begin. The first character came on stage and I remember exactly what the character was and we both just sat there. We didn’t say anything to each other. We just sat there watching the show but I think from that moment we knew that this is what we were going to do and spend the rest of our life doing because the feeling we got from then especially once the show started like Kevin said before we got goose bumps. We forgot about the rest of our lives and it was just what was happening on the stage and that was the most important thing. So now when we go on stage every single time we go on stage even if we are ill or we have injuries and things we always take ourselves back to that moment because we know there is somebody in the audience or probably many people in the audience that have never seen a Cirque du Soleil show before and they are there to see what we do so we perform for them. So every time that is our inspiration. We perform for those who have never seen a show or something bad happened in their lives and we are going to try and make them at least feel happy for those 2 hours they are in that space with us. We regularly receive emails from people that have seen us perform and said it has changed their lives. You know some very, very beautiful emails and that have helped us along. Fei:	Wow, that is so amazing and I love the fact that you were among the audience and you looked at the act saying, “I can probably do this. This is what I wanted to do. I can replicate this.” I personally can do that myself. So this is my way of sharing my experiences with the world. Atherton Twins:	We always do that and in every show we have done, in every performance we have done five minutes before the performance starts Andrew and I will go to a space where we can go and view the audience and we will just feel that for five minutes. That is a part of our preparation for the show. We like to go out and just feel the audience and check them out just so we can see who we are performing for. That helps us and we kind of bring that on stage with us because of them [Laughter] [Inaudible 00:40:24] I will look around the audience every day. They don’t see me but I can see and I can do that all. Every day is different. It can be it is not a particular type of person but I just see something in that person and I don’t really know what it is and that is whom my performance is for that night. Fei:	I love that. That should be the title of the book if you were to write a book. Atherton Twins:	It does help because like he said sometimes we can lose the fact that there are 200,000 people and you can lose that intimacy and always especially the act we want to do we want to keep that intimacy so that it will be in a relationship between each of audiences and relationship with somebody else, few people in the audience and bringing them on to stage with us a little bit and it helps them. Fei:	It is so cool because when I was sitting in the audience there was a guy with crazy costume who totally winked at me. “Did you just see that?” he was looking at me. I had no idea. When you get on stage do you see is there anything that you see among the audience which is completely like pitch black? What was that experience like? Fei:	Wow. I remember watching the Academy Awards show. I was just completely blown away and I remember just for me personally in the show when the two guys were flying I remember just like a ton a block like, “I need to catch them.” There is an urge in me. I remember watching the Academy Awards show just Brad Pitt or I don’t know who else was in the audience they were just with their mouth open like zoomed in super close. Atherton Twins:	It was easy for us because that was our theater we have been performing in that show in LA for maybe a year that when we did the Academy Awards and then again like I said before we performed at the Academy Awards we went to the curtains and we looked out and in my life that is the most nervous I had ever been not just my hand but my whole body started to shake and I could not stop it from shaking and I am like, “Oh my God, I am really going to perform.” I saw myself and I am shaking because I saw the likes of you know Angelina Jolie and Brad Pitt in the full blow and then I thought, “Okay, it is only one opportunity and there are millions of people watching at home we cannot mess this up. Let us think about that. We never once go on stage thinking, “Oh, we are going to mess this up.”“ But that one night that is all I was thinking about. Fei:	Really? You don’t look like a nervous kind type to me at all. Fei:	Wow, I saw like an extreme level of comfort with everybody performing in that theater and you just clarified sort of the mystery for me. Atherton Twins:	Every show is a bit different. This is one show where we do have a little bit more time. The other shows we will have shoots and we will have things to do throughout the show on top of our act and we never stopped and we both are like that you know we like to do a 90 minute show. In Iris in Los Angeles we were the first act to go on stage. So we will on and we will go and perform our act. It is a 6 minute act. As soon as we exited the stage from the act we would run and go into our dressing room for a quick change, go back to the stage and perform another cue and it was like that for 90 minutes. We would finish the 90 minutes show and we were sweating and we love that. You know we love to kind of work hard. In this particular show we are doing now we have more time [Inaudible 00:45:26] so we go and do our 5 minute acts and then on top of that we have 3 more cues throughout the whole show. So it changes from time to time. You might not recognize this because we are in different costumes but we are doing a lot more. Fei:	When you are in different costumes do you also have other, are you basically? Atherton Twins:	We are playing characters. We are playing different characters. So like Kevin said in Varekai from start of the show to the end of the show we never stopped. We did our thing almost in every single act, we will be performing and then it was almost our act was the easiest part of the show. It is like that in Varekai and it is like that in Iris we worked up full and we are doing our act. I think in Varekai we performed in 3 full acts from start to finish and then in Iris the same. Fei:	Wow. So you have, I couldn’t believe this until I am chatting with you guys. It shows you work more than I do and you are physically much more demanding and mentally too. Two shows a day, 5 days a week. How do you find time to you know kind of workout, take care of your personal stuff? How does that schedule to stay in shape? And one other question is when you find time to work out? Perhaps the show itself is your perfect workout. Atherton Twins:	I think [Inaudible 00:46:57] comes in very good because we are always like you said the gymnastics lifestyle we would wake up at 6 and we will be in the gym and we have 3 training sessions per day. So after doing that for 17 years what we are doing now is a little bit easy lifestyle because we are not going gym, we are retired and we don’t go to the gym that early. We usually go at 9 o’clock in the morning to like get our bodies moving and we do one hour of workout and that is why it is very easy because we are used to so much more. So we will go and do one hour workouts pretty much every day and that keeps us healthy. The personal stuff we usually find time. We only go to work here in Las Vegas round about, the show starts at 5 so we will go to work at 5 and do two shows and we will be off stage by 11.15. So during the day we have a bit of time to catch up with our personal lives and extra training. I have a family now, a little girl and a boy so they take up most of the time. Fei:	Wow. One of the questions we love asking is a routine questions which is, what is the first 60 minute of your day like? You know what do you read? Do you meditate? How do you kind of peel off from the acting world, performing arts kind of isolate yourself? Atherton Twins:	We are different again and again we are also very similar. We do wakeup very early. We wake up at 6.30 in the morning. At that point we catch up with our emails. We get a lot of emails so we try and catch up with them and we reply as most we can. After that we generally go to the coffee shop and we will have coffee and chat with our friends. A little bit of difference in Andrew and myself compared to most of the performers at Cirque is we are both morning people. The people that we work with they are energized still much after the show. They do everything after the show. Andrew and I don’t. We finish the show and we come home. We really unwind ourselves quite quickly and we go and sleep. We wake up at 6.30. We always will. That is the timing we like and we are like the morning people and it really gives us the chance to like Andrew said catch up on our emails and that time is most valuable to us. Fei:	Do you meditate? I know both of you probably like to bike a lot. What are your interests outside of you know working and working out, that kind of calms your mind? Atherton Twins:	Again like recently I changed a lot because of my family. I have children now and so I guess my meditation is the first thing in the morning when I wake up I need some quite. So I like some quiet. My wife always asks me, “Why do you always wake up so early?” It is probably the only quite time from 6.30 to 7 that I get, 30 minutes of time that is quite for me to do what I want to do. As soon as the kids wakeup then all my attention is focused on them. So my meditation is [Inaudible 00:50:38] so I can go and take a bit of time for myself as well as the coffee shop. Fei:	Nice, what about you Kev? Atherton Twins:	I like to bike, I love to walk in the nature, scuba diving also, I like all that. Atherton Twins:	We have an amazing balanced life both of us. We balance our lives and I don’t know we both have important things and balance not only your professional life but your personal life too. Not go to extremes on and off because that is the problem that people can generally have and that affects so many things that you have and things like that. So we do try to focus on a balanced lifestyle [Inaudible 00:51:52] we will generally try and playback and just lead that whole balanced life. Fei:	That is beautiful because again 17 years of gymnastics, 15 years of such extreme art and performing art I think one of the reasons if I am not wrong that you are able to do this for this long is because you have always led a balanced life together, separately. What are some of the questions especially in your position you get a lot of emails from fans? Fei:	Yeah, only 3 or 4 hours away. Atherton Twins:	That is the issue. It is going to be inspired by Iris. It is going to be inspired by Iris. We will be creating more of a Broadway Theme Show. Fei:	Wow, what it is called? Fei:	[Inaudible 00:54:53] that is awesome. I am so excited. Practically what time next year – beginning, midyear? Atherton Twins:	The show we will start to create on January the 6th and then we will soft premiere which is basically we will premiere the show and we will just listen to the audience and may be tweak it and then it gets back on stage on April 14th. We will premiere on June 2nd. It is going to run all year. Fei:	How do I self select myself to be like the early audience? Atherton Twins:	We will let you know. You will be sent the invite. Atherton Twins:	Even yesterday some of the artists on Cirque du Soleil, we just told them yesterday that we will be leaving this show and going to do another show and many of the artists came up to me especially because you know and they would say, “Why are you doing this?” I didn’t have any answers because everyone is telling me not to do it. That is one of my biggest reasons because I am being told not to do it. [Inaudible 00:56:46] let us go and do it. It is not like everyone gets the chance to perform in a Broadway Show so I don’t know we would have regretted so much if we didn’t do that. So we have got to work it and whether it is a success or it is a flop it really doesn’t matter but the fact that we accepted and we jumped and we are both flying so it is something we have got to do. Atherton Twins:	Everywhere. It is crazy like Kevin said when we were creating Varekai is our first and obviously we were young then so we were petrified about how we were going to be able to do this. There was a lot of pressure for us to create act with Cirque du Soleil. It was going to be a standalone act. We didn’t know it was going to work or it was going to fail. We researched about it so much. We went everywhere. We went to galleries, we went through art books, and we looked at the dance world because that is where the inspiration came from. [Inaudible 00:58:30] try that and we will try and modify it slightly. So yeah we just got it from I mean a lot of the images you will see a painting and think this is beautiful and especially beautiful to look at, many will be visually beautiful to see and to embody. We call them snapshot moments. [Laughter] [Inaudible 00:58:53] he wouldn’t recognize if somebody was taking a photograph and I would be the most difficult still you know it was quite straining for me. He will be looking at this person in front row and recognize, “You have not taken the foot strap yet”. I will be like going redder and redder. [Laughter] [Inaudible 00:59:30]. Our inspiration was and is you know like Kevin said we take it from everywhere and even now we still do in our act we never settle, never settle. We always want to do something new. In every show we try to bring something new. It is what we do. Atherton Twins:	Time changes. Only time has changed. The culture changes and what people see and think to be beautiful changes too so we will always try and. We listen to the young people because we are slightly old [Laughter]. So listen to the young people because they [Inaudible 01:00:11] we will always try and modify what we do to continue with current trends. Fei:	That is awesome. I love that. To respect your time I will close on the final question. You are so fun to talk to. I completely adore you both so much. [Laughter] So it is getting [Inaudible 01:00:37] related for a second. My final question would be, what is your definition of a meaningful and fulfilling life to you, to each one of you? It is very, very, very similar. You know I wake up every day with no regrets and there will be no regrets. When I go to bed I want to be happy with that and the most important thing to me now is you know Cirque du Soleil is always a big thing in my life until I had a family. Like you mentioned right at the beginning when we did Varekai I never missed a show and I went on the stage every single night even when I was ill or injured I went on stage. Same happened in Iris. When I missed my first show was during the birth of my first child. Fei:	Back to the show. Fei:	It is amazing. Thank you. I am so inspired and you have forever changed my life. Thank you so much for your time. I so look forward to doing nothing else today but work on this, compiling it and share with the world. You have said so much more to me I think than you have said to any media. So I feel so privileged to be here. Atherton Twins:	Thank you so much for taking your time to talk to us. We have a lot more to talk about. I hope one day you get to see us perform because we can talk about it and talk about the relationship between both the worlds. Until you see it up in the sky you never really know. Like you saw the performance in Varekai and didn’t think we were brothers. There is a difference. The intimacy that cannot be replicated between. I don’t think. That is what people tell us. I hope you get to see us perform live. Fei:	I will. I promise you I will. Fei:	I did already. That sounds great. Please reach out anytime and I will keep you posted on the progress. I will and hope to. Atherton Twins:	Thank you very much. Fei:	Thank you so much. Have a wonderful day.